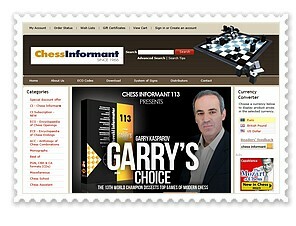 New Delhi: Do you aspire to be the World Champion of Chess in your life? Have Carlsen’s moves and game talent at the recent World Chess Championship hooked you to this game like never before? 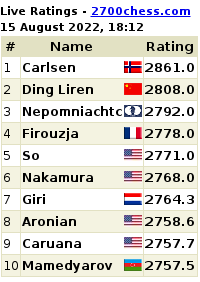 Would you like to be in Carlsen’s shoes one day? 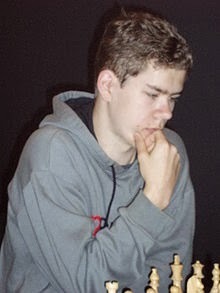 Send your thoughts in not more than 500 words on “How Magnus Carlsen has inspired you by winning the World Chess Champion title at the young age of 23” and “What lessons you have learnt from seeing his hard work and dedication to a game that originated in India thousands of years ago”. - Entries should not be more than 500 words. - Entries only from students between 13-15 years will be accepted. - An age certificate from your school is compulsory. - Only one entry per student is allowed. - Bulk entries from schools will not be accepted. Only individual entries should be sent. - Competition is valid for Indian students only. - Please provide your full name, name of your school, address, a passport size photograph and contact details along with your entry. No phone calls/email enquiries please.Results will be announced only to the winners directly, and via the Embassy’s website. Attn: M. Arya, Royal Norwegian Embassy, 50-C, Shantipath, Chanakya Puri, New Delhi. Twenty-six-year-old American Grandmaster Hikaru Nakamura has won the 5th London Chess Classic 2013, staged this year as a rapid chess tournament and billed 'the Super-Sixteen Rapid'. Nakamura defeated former World Chess Championship Challenger Boris Gelfand of Israel 1½-½ in the final. As the world number four on the FIDE Rating List for classical chess, and number three at rapid chess, Nakamura's result was far from being a surprise but it was a significant achievement in the career of a remarkable player who must be a leading contender to threaten Magnus Carlsen’s world crown in the next few years. Hikaru’s progression through the competition was impressive. He scored +2, =4, -0 in the preliminary phase, and then improved that to +3, =3, -0 against sterner opposition in the knock-out phase. To go through without a loss was a clear sign of strength. His toughest moment was when he came close to elimination in his second semi-final game with Vladimir Kramnik but he showed an amazing resilience in first holding the former world champion at bay and then taking advantage of Kramnik’s evident state of confusion to finish the match off with a win. In the final match against Boris Gelfand, Hikaru showed the courage of his convictions by going straight for an ultra-sharp tactic in the opening against a player who had hitherto proved himself the best defender in the event, and also at this time control in world championship qualifiers. They say ‘fortune favours the brave’ and Hikaru’s conquest of this elite rapid chess event backs that up. Game 1 - win for NakamuraHikaru received the white pieces in the draw for colours conducted by chief arbiter Albert Vasse, and they launched into a Grünfeld Defence, one of the most fashionable of all current super-GM openings. Hikaru's 10.Ng5 is quite a double-edged move but Boris avoided the standard continuation 10...Nb6 by playing instead 10...Nc6. Hikaru's response was brave and speculative – 11.Nxf7!? 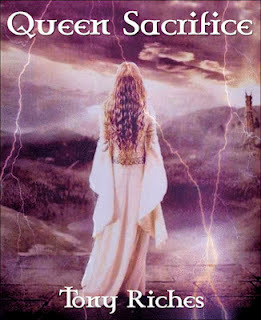 – a move we all like to play against a castled king, whatever level we play at. On the face of it, the line looks very dodgy for Black as he has to give up the exchange, but it is almost inconceivable that Boris wouldn’t have something prepared for this. By way of compensation he demolished the white centre and got his minor pieces to strong outposts. Was it enough? The unofficial grandmaster jury in the VIP Room was undecided: the Hiarcs engine thought White was better around move 15 but Matthew Sadler and others preferred Black. Hikaru may not have been entirely confident of his chances as he thought for nine minutes about his 16th move: quite a big chunk of his allotted 25 minutes. However, within a few moves, the initiative seemed to have shifted back to the American after Boris played the dubious 17...Ne4. "He's blown it," exclaimed GM Julian Hodgson, perhaps a little melodramatically. Then, calming down slightly, "I think Hikaru's over the worst now – he'll survive." Julian might have been right the first time. The next few moves saw Hikaru consolidate his material advantage, in machine-like fashion, and Boris never really looked like getting back into the game. At move 25 he used around half of his remaining six minutes, suggesting he was running out of ideas. More solid moves followed from Hikaru and Boris had to resign. Boris, with White, played the Averbakh variation of the King's Indian Defence. It followed theory for about 15 moves and Boris acquired a space advantage. However, Black’s position remained playable and White couldn’t bring any real pressure to bear on it. Hikaru used his tactical prowess to exchange queens and then give up the exchange for two pawns. It might sound risky but Black’s pieces remained well-coordinated and Boris’s pair of rooks had no useful inroads. Boris pressed too hard and made a slip. Eventually only Hikaru could win the position but, since he didn’t need to, he was happy to acquiesce to a draw. London, Dec 15: Grandmaster and former world junior chess champion Abhijeet Gupta went down fighting against Jon Ludvig Hammer of Norway and had to settle for a tied seventh place finish in the open section of London Classic here today. After a disappointing exit by former world champion Viswanathan Anand from the quarterfinal of the premier event, Gupta, too, could not make it to the podium as he lost his way against Hammer. Hammer won the open section scoring 7.5 points and Abhijeet ended on 6.5. Among other Indians in the fray in the last round, Tania Sachdev and Eesha Karavade also ended on the losing side against Peter Sowray of England and Viorel Iordachescu of Moldova, respectively. Eesha finished the tournament on six points, while Tania scored five points out of a possible nine. Grandmasters D Harika and M Shyam Sundar finished on a positive note by winning the last round games with both scoring six points in all. It was an anti-Grunfeld defense by Hammer that allowed Gupta to equalise early but the Norwegian kept pressing on the queen side. Gupta sacrificed two pawns to lure the white queen out but missed out on a forced draw vide a piece sacrifice in the middle game. Once on top Hammer gave no chances. 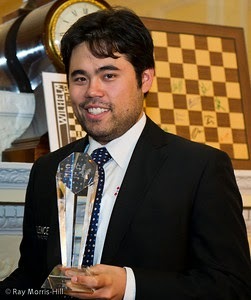 Meanwhile, Hikaru Nakamura of United States deservedly won the premier event and took home a first prize of 50000 Euros defeating Boris Gelfand of Israel in the final. Nakamura was at his creative best in the first game with white pieces where he outplayed Gelfand from a Grunfeld defense and then drew the second game easily to win the two games mini-match by 1.5-0.5. Earlier in the semifinal, Nakamura put it across Vladimir Kramnik of Russia after surviving some scare in the first game. The American had things under control in the second game that he won to reach the final. In the other semifinal, Gelfand accounted for English Michael Adams in a tense affair winning the first game and drawing the second to set up the clash with Nakamura. London: Former World Chess champion Viswanathan Anand bowed out of the London Chess Classic 2013 after losing the quarter-finals to Vladimir Kramnik of Russia 0.5-1.5 here at the Olympia. Anand, who had shown fine form coming in to the quarters, ran out of steam in the second game with white pieces and found himself in a lost position in almost no time in the 1,50,000 Euro prize money tournament. Watch Live at the London Chess Classic 2013 official website. Michael Adams of England kept the local hopes alive by defeating Russian Peter Svidler in the tiebreaker while Boris Gelfand of Israel stole the limelight ousting Fabiano Caruana of Italy. In the other quarter-final, Hikaru Nakamura of United States defeated Nigel Short to cement his place in the semis. It turned out to be a disappointing second game for Anand from the white side of a queen pawn opening. 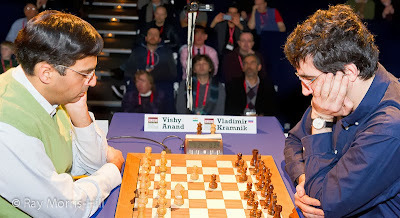 Kramnik opted for the age-old Tarrasch defense and Anand avoided routine theory that allowed the Russian to equalise without batting an eye. Anand made a positional error on the 15th turn that gave Kramnik the initiative to look for more and the latter came up with some sterling manoeuvres to seize the advantage. Anand was already fighting a lost position after 20 moves and a final blunder cost him a piece and the game soon after. While the second game was almost a no-show by Anand, the first game was a clear indication of his good form displayed thus far. Playing black Anand went for the Semi-Slav defense and looked a little worse out of the opening when Kramnik moved his queen over to the sixth rank. However, Anand's response - a brilliant retreat ? left the spectators in no doubt that they were in for a spectacular treat in the mental boxing between two modern greats. The game ended in a draw in the ensuing endgame and it was a rather abrupt end to the contest when Anand failed to find his rhythm in the return game. Nakamura, like Kramnik, cruised in to the semifinal defeating Short 1.5-0.5. The American won the first game with black and then drew with white making things look easy. Michael Adams' early lead against Peter Svidler was squared off by the Russian in the return game but in the tiebreaker the English was spot on and won both his games in the ten-minute chess. Boris Gelfand had a similar tale to tell in the tiebreaker against fancied Fabiano Caruana after both games under rapid time control ended in draws. In the open section, former world junior champion and Grandmaster Abhijeet Gupta put it across Jahongir Vakhidov of Uzbekistan to emerge in a three-way lead. London: Former World Chess Champion Viswanathan Anand found his way to the knockout stage in the London Chess Classic with an easy draw against tailender Andrei Istratescu of France in the fifth round of the preliminaries that concluded here at the Olympia on Friday. Michael Adams of England trounced compatriot Luke McShane and joined Anand on 11 points and the two meet in the next round to determine the group winner. 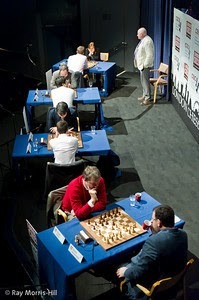 Traditionally a super tournament, the London Classic this time became a Rapid tournament as the world championship was held just two weeks before its commencement. Anand will play as black against Adams in the decider for the first place in the last round having promoted himself to the knockout quarterfinals in the 16-players event split in to four groups. Among other groups, Russians Vladimir Kramnik and Peter Svidler looked poised to qualify from the 'B' group while in the 'C' group Boris Gelfand of Israel and Hikaru Nakamura of United States already made the cut like Anand and Adams. The situation in the 'D' group is also clear with Nigel short of England hitting form and the two qualifiers from here are Fabiano Caruana of Italy along with the English Grandmaster who holds a high repute. London: Former World Chess Champion Viswanathan Anand continued with his winning ways and scored a second victory against Luke McShane of England to secure a commanding lead in the preliminary round of the London Chess Classic 2013, on Thursday, at the Olympia Centre. On what turned out to be another fine day, Anand came up with some brilliant planning to score two back-to-back victories after earlier crushing Andrei Istratescu of France in the third round game and sealed his place in the knockout stage of the Classic this year reserved for the top two finishers. With two games still to come in the preliminaries, the Indian ace is sitting pretty on ten points in the 'A' group, two ahead of Michael Adams under the Soccer-like scoring system in place here. McShane on four points is a distant third while Istratescu is yet to open his account. Watch Live at the official website of the London Chess Classic. Earlier in the third round, Anand crushed Istratescu from the black side of a Sicilian Alapin. Anand controlled the centre and came up with a well judged exchange sacrifice to march his way to victory after 50 moves. Meanwhile in the 'B' group, Russian Vladimir Kramnik was joined by compatriot Peter Svidler on seven points after a tough day for the former. Drawing with Sadler in round three, Kramnik lost to Svidler who is scripting a fine comeback after getting just one point from the first two games. The group is closely matched with Matthew Sadler in third place on five points and Jonathan Rowson not too far behind on four. Boris Gelfand of Israel was joined by Hikaru Nakamura of United States in the lead in 'C' group on eight points and these two seem poised to make it to the knockout stage from here. World's strongest woman player ever, Judit Polgar of Hungary, won her first game in the event defeating Gawain Jones of England but that took her to only four points for a joint third spot. What Anand is doing in the 'A' group, Fabiano Caruana seems to be replicating in the 'D' group. The Italian made sure of his qualification in the next stage taking his tally to 10 points and he is now followed by highly regarded and former world championship challenger Nigel Short of England who is on seven points. Group A: Andrei Istratescu (Fra) lost to V Anand (Ind); Michael Adams (Eng) drew with Luke McShane (Eng). Group B: Jonathan Rowson (Eng) lost to Peter Svidler (Rus); Matthew Sadler (Eng) drew with Vladimir Kramnik (Rus). Group D: Fabiano Caruana (Ita) drew with David Howell (Eng); Emil Sutovsky (Isr) lost to Nigel Short (Eng). Group A: Anand beat McShane; Adams beat Istratescu. Group A: 1. 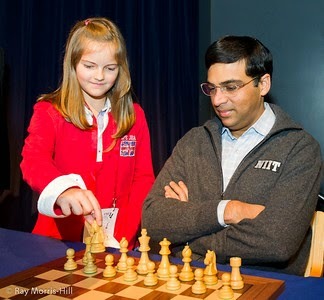 Anand (10); 2. Adams (8); 3. McShane (4); 4. Istratescu (0). Group B: 1-2. Kramnik, Svidler (7 each); 3. Sadler (5); 4. Rowson (4). Group C: 1-2. Gelfand, Nakamura (8 each); 3. Polgar (4); 4. Jones (1). Group D: 1. Caruana (10); 2. Short (7); 3. Howell (5); 4. 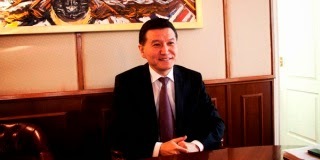 Sutovsky (0). London: Indian ace Viswanathan Anand put the disappointing loss in the World Championship behind him and started his campaign in style by beating local Luke McShane in the first 'A' group game of the London Chess Classic that got underway here. Anand's victory came after some precise calculation and deft manoeuvres on his 44th birthday, leaving McShane gasping from a point where he thought he had a chance. The five-time world champion Indian thus started with three points under the Soccer scoring system in place here that gives a three points for a win and one for a draw. Viswanathan Anand put the disappointing loss in the World Championship behind him and started his campaign in style by beating Luke McShane. Anand was not the only one to start with full points as Michael Adams of England matched him on points at the expense of Andrei Istratescu of France in the same group. With 16 players taking part this year, the Classic is divided in to four groups and the top two from each group will reach the knockout stage after a double round robin. Anand heads the 'A' group on three points after the first round sharing the lead with Adams while McShane and Istratescu are yet to open their account. Russian Vladimir Kramnik was lucky to score over compatriot Peter Svidler from a seemingly drawn endgame while wild card entrant Jonathan Rowson of England scored over country-mate Matthew Sadler from a similar situation in the 'B' group. The 'C' group saw local hopeful Gawain Jones holding Hikaru Nakamura of United States to a draw while former world championship challenger Boris Gelfand of Israel got the better of highest rated woman Judit Polgar of Hungary. In the 'D' group, English duo of Nigel Short and his former protege David Howell played out a draw while rating favourite Fabiano Caruana of Italy shot in to lead defeating Emil Sutovsky of Israel.